Bucks County landscape #1, 6.75" x 10.75" (image), 13.5"x17.5" framed, s.l.l. Born in Louisville, Kentucky, Frank English is more closely associated with the Philadelphia area, living in Claymont, Delaware, in Philadelphia proper, and in Point Pleasant, Bucks County, Pennsylvania. 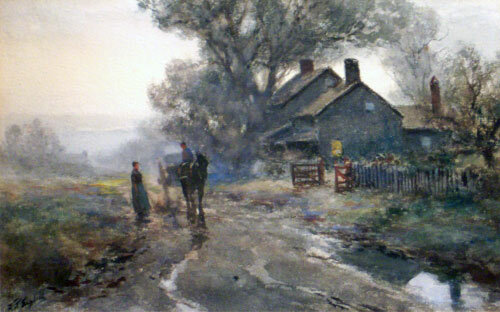 Although a fine painter in oils, English built his reputation upon his watercolors at a time when the watercolor medium had only begun to establish itself as a major artistic medium in the United States. Living in Philadelphia during the 1880's, English attended the Pennsylvania Academy of Fine Arts, where he likely received instruction from Thomas Eakins and Thomas Anshutz, among others. The artist also became associated with the Philadelphia Sketch Club, serving as a sometime officer of the Club, and with the Art Club of Philadelphia. In 1910, English relocated to the rural environs of Point Pleasant, Pennsylvania, where he remained for the rest of his life. Although he worked near the artists communities of New Hope and Phillips Mill, he pursued a more solitary existence. 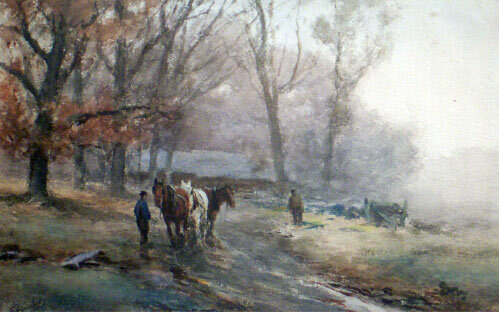 His watercolor renderings of the bucolic Bucks County landscape and its residents were his most characteristic works. English enjoyed considerable success in his lifetime, as is evidenced by the number of works which were reproduced and disseminated as art prints, advertisements and calendars. Bucks County landscape #2, 6.75" x 10.75" (image), 13.5"x17.5" framed, s.l.l. Works by Frank English can be found in the Brandywine River Museum, the Canton Museum of Art, and the Woodmere Art Museum. Note: Information on Frank English is from Michael William Schantz, Frank English: Images of a Vanishing American Landscape, reprinted in Resource Library subcategory of the Traditional Fine Arts Organization web site.